Flat in complex with swimming pool. A twin bedroom and a double sofa bed. 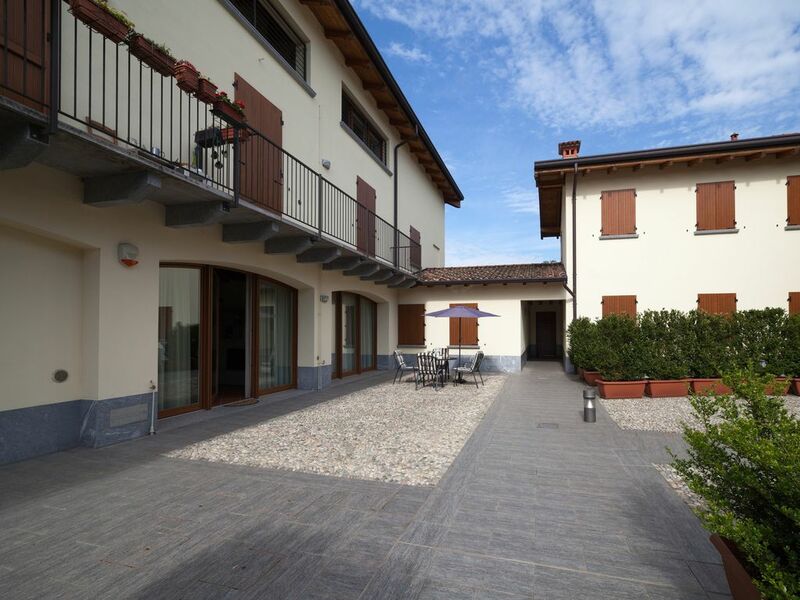 Home for holidays Monte Canto is a place of relaxation near Bergamo, surrounded by nature on the banks of the river Adda. Inserted in a residence with swimming pool recently built, the apartment is enclosed in what was a rustic court, now restored. The spacious apartment offers enough space for 4 people and is equipped with all the amenities you need (washing machine, dishwasher, TV, wi fi) as well as a fully equipped kitchen. Holiday Monte Canto can be an easy starting point for hiking or cycling to discover the nature of the river or a base for visiting the nearby cities of art such as Bergamo, Milan and Brescia. A few dozen kilometers from the Lake Como and Lake Iseo, and the most famous Franciacorta. For mountain lovers not the Bergamo valleys will be distant, with beautiful landscapes and typical regional foods. The bathroom has been recently renovated. Comfortable and functional. We had a lovely stay in this flat in the countryside near Brivio. It is in a pleasant residential complex, with a good swimming pool, easy car-parking, and a good supermarket 4 minutes' drive away. I would definitely recommend having a car. It makes an excellent location for driving to different parts of Lake Como, Milan, and Lake Maggiore, but the nearby countryside is lovely too. It's also reasonably-priced, in contrast to properties on the lakes themselves, which tend to be a lot more expensive. The River Adda is nearby, and flows through Brivio, which makes for beautiful riverside walks and cycling. (There is a good bike-hire shop a few miles away, beside the river). Owners were very friendly and helpful. The flat was well-equipped and in very good condition. We had our own terrace for eating meals outside, and our own sun-loungers and parasol by the pool. The welcome hamper was much appreciated too. Would definitely recommend. Sehr schön. Tolle Wohnung. Schöne Anlage mit Pool. Vielen Dank für die schöne Zeit. Unsere beiden Kinder haben den Pool genossen. Die Wohung ist geräumig - obwohl nur zwei Zimmer. Küche gut ausgestattet. Die Lage toll,wenn man in die Städte (Bergamo, Lecco oder auch Mailand) möchte. Zu erwähnen wäre vielleicht, dass es keine Ferienanlage ist, sondern die Anwohner dort wohnen. Waren alle nett - hat also nicht gestört. Wir möchten wieder kommen! Alles zeer verzorgd. Goede ontvangst en een leuk verblijf gehad. Appartement très agréable, très bien équipé et très propre. Schöne, gut ausgestattete Wohnung in ruhiger Lage. Sehr nette Vermieterin, die immer erreichbar war. Einkaufsmöglichkeiten in kurzer Entfernung. Guter Ausgangspunkt für Besichtigungen z.B. Bergamo oder Mailand (per Bahn!). La signora gentilissima disponibile, ci ha offerto la colazione per i giorni del mio soggiorno. La casa nuovissima con arredamento moderno e nuovo. Letti comodissimi, la casa pulita e confortevole. La consiglio a tutti chi vogliono un posto tranquillo e silenzioso.